...but the specific date remains TBD. At the tail end of March, the Wyoming Democratic Party quietly released the proposed details of its 2020 delegate selection process. The draft delegate selection plan is more modest compared to some of the changes offered up in other caucus states. Whereas the majority of the remaining caucus states are exploring some variation of party-run primaries (Alaska, Hawaii, North Dakota) and/or ranked choice voting (Iowa, Nevada), Democrats in Wyoming are keeping the caucus/convention process in the Equality state in line in most respects with the process the party has utilized in past cycles. Much of it, however, remains an unknown until after the Wyoming Democratic Party state central committee meeting on April 27. For instance, much is unsaid -- in fact it is literally left out -- about efforts at increasing participation as called for in Rule 2 on the DNC delegate selection rules for 2020. Those blanks will (likely) be filled in after the SCC meeting. 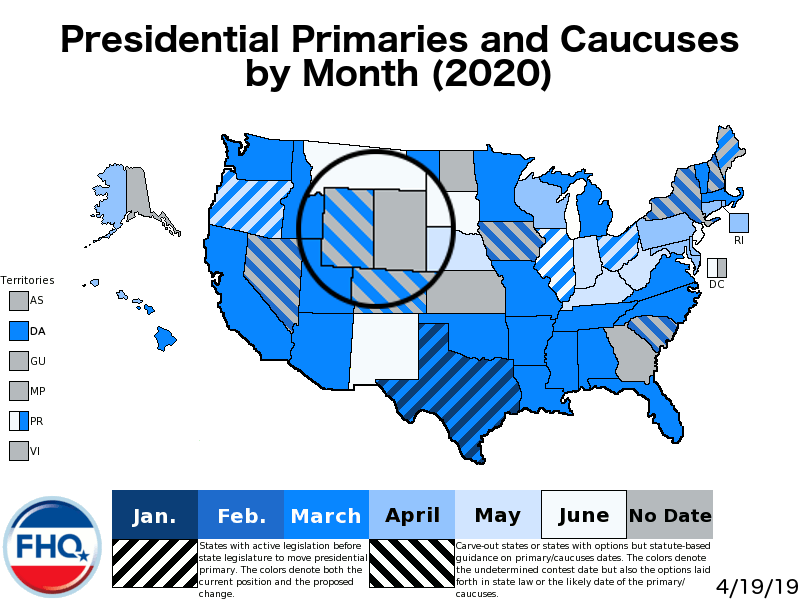 What is known about the process is that Wyoming Democrats will once again conduct caucuses for the 2020 cycle and those will fall some time in March; up to a month earlier than the April 9 caucuses the party held in 2016. Additionally, the party will pool all of their 13 delegates in the selection process. Instead of applying the 15 percent threshold to district, at-large and party leaders/elected official delegates -- three separate, individual applications -- as is customary, Wyoming Democrats will apply it only once to the 13 delegate pool. It is a small change in a small delegate state, but one that could have an effect on allocation on the margins. At most it affect the rounding for who would get delegates and who does not (and how many). This one will be worth monitoring as it works its way through the review process. How receptive the Rules and Bylaws Committee is to that transition in the rules remains an open question. But again, the shift breaks with how allocation is typically done in the Democratic process. There is far more pooling of delegates in the Republican process. The Wyoming caucuses change is now reflected on the 2020 FHQ Presidential Primary Calendar. Back in January, FHQ, discussing prospective primary movement during the 2019 state legislative sessions convening across the country, highlighted the group of mid-Atlantic/northeastern states that have seeming settled in late April since the 2012 cycle. Under Democratic control, states like Connecticut, Delaware, Maryland, New York and Rhode Island not only moved away from February presidential primary dates leftover from the 2008 cycle, but moved deeper into the calendar for the 2012 cycle and have stayed there. That made more sense in 2012 when Barack Obama was seeking renomination on the Democratic side -- the stakes were lower and the costs of a later primary less -- but that group of Acela corridor states maintained their April positions despite an open nomination in 2016. Now, it could be argued that during the time that primary date changes were being considered by state legislatures in 2015, Hillary Clinton was a prohibitive favorite to win the 2016 nomination. States with Democrats in control of state government, in turn, may have been less likely to make any changes to the presidential primary date. But the outlook for the 2020 nomination is and has been a wide open race. Yet, in none of those states, save New York (which operates under a unique set of circumstances), have made any moves toward a presidential primary change. All has been quiet. And that silence typically will signal no primary movement. However, there has been an additional signal out of Delaware. No, there is no proposed presidential primary date change, but for the second consecutive state legislative session in the First state, there is an effort underway to attempt to align the September primaries for state and local offices with the presidential primary in April. HB 89 passed the state House in Delaware in 2017, but died in the state Senate. And now in 2019, HB 41, a nearly identical proposal, has so far followed a similar trajectory. The plan to consolidate state primaries with the April presidential primary flew through the state House in January, but has again hit the wall in the state Senate. The legislative session adjourns in June and the bill still has time to work its way through the state Senate, but the proposed move is less important for the move than it is for the anchor point on the calendar.1 Linking those primaries for state and local offices to the presidential primary in Delaware is the clearest active effort among those April Acela primary state signaling a non-movement. The others have been more passive at this point. As of now, Delaware is scheduled to have an April 28 presidential primary on the latter half of the 2020 presidential primary calendar. 1 Delaware was a late mover in 2011, the last time the state shifted its presidential primary date. That legislation was passed toward the end of the legislative session that cycle. With the release of a draft of its 2020 delegate selection plan, the Utah Democratic Party has confirmed that it will utilize the new presidential primary signed into law recently by Governor Gary Herbert (R). The confirmation means that Utah Democrats will return to a primary for delegate allocation for the first time since the 2008 cycle. The state party opted for caucuses in 2012 when there was no national party rules-compliant primary option. The February date in state statute was too early and the late June option added that cycle for state Republicans was too late. Both parties used caucuses in 2016 when the presidential primary was not funded by the state. Like the last time Utah Democrats used a primary for delegate allocation in 2008, the election will fall on Super Tuesday. In the Democratic delegate apportionment formula, Utah is not delegate-rich, falling behind ten of the 13 states now slated to hold delegate selection events on Super Tuesday. Finally, in the switch from 2016 caucuses to 2020 primary, Utah becomes part of another trend. The Beehive state now joins Colorado, Idaho, Minnesota, Nebraska and Washington state as states to have opted into state government-run primary elections for the 2020 cycle. The Utah Democratic Party decision opt into the primary will be reflected on the 2020 FHQ presidential primary calendar. It was decision time this past weekend as the Washington State Democratic Party convened in Pasco. Among the items on the agenda was delegate selection in 2020. Chiefly, the question before the Rules Committee on Saturday and the State Coordinating Committee on Sunday was whether the party would continue to use the caucus/convention system it has used to allocate and select delegates to the national convention throughout the post-reform era. But a newly early and revamped semi-open presidential primary bill signed into law in March removed most of the conflicts the Democratic Party in the Evergreen state have historically had with the primary option available to Washington parties in the past. Moreover, the state party has been facing pressure from vocal Democrats in the state to make the process more democratic; something that was demonstrated by the over 93 percent support for the primary option in an unscientific poll open during the draft delegate selection plan public comment period. On top of that, the national party rules for the 2020 cycle urge state parties to increase participation and use state-run primaries where available. In total, that was enough to nudge the Washington State Democratic Party to break with tradition. By a vote of 11-5 on Saturday, the Rules Committee recommended that the party shift to the primary option. That was followed on Sunday by 121-40 vote by the State Coordinating Committee in favor of a primary. The decision officially moves Washington Democrats into a March 10 slot on the 2020 presidential primary calendar. That primary will coincide with contests in six other states including the primary in neighboring Idaho. The Washington primary change is now reflected on the 2020 FHQ Presidential Primary Calendar. 3/12/19: Washington Democrats Will Allocate Delegates in March, but How? Last week the Democratic Party in Washington, DC released for public comment its draft delegate selection plan for 2020. However, one of the details missing from the document was a date for the planned presidential primary in the district. That is all the more unusual because the primary date set in district statute. But there are at least a couple of catches with the third Tuesday in June date outlined in the law. First, that date is too late in the calendar and thus non-compliant under national party rules. The district party would face penalties from both national parties if it chose to allocate delegates through a primary scheduled so close to the convention. Alternatively, it might force one or both major parties in the district to shift to a caucus/convention as DC Republicans did for 2016. What has also given DC Democrats pause in filling in the primary date in the delegate selection plan is that there is some uncertainty about where on the calendar the primary will land. Yes, the date is currently set, but the DC Council is considering a change. Only, the change is not nearly as dramatic as some of the Democratic members of the Council were speculating about during a February meeting of the DC Democratic Party district central committee. Back then there was talk of aligning the DC presidential primary with the primaries in Maryland and Pennsylvania at the end of April. Now, however, there has been a bill introduced in the DC Council to move the primary, but not into April. Instead, the plan laid out in B23-0212 is to nudge the DC primary up to the first Tuesday in June in presidential years (leaving the primary in midterm years to remain on the third Tuesday in June). This is a modest shift but it would be enough to move the DC presidential primary back into compliance with the national party rules. One footnote to add to the predicament in which the DC parties and Council find themselves, is that if this shift is successful it would represent the second change to the DC primary schedule since 2017. The Council made the decision in 2018 to move the primary from the second Tuesday in June to the third Tuesday in June. In other words, one step back was needed to move two steps forward. 2/7/19: DC Presidential Primary on the Move Again? The Washington, DC presidential primary bill has been added to the 2020 FHQ presidential primary calendar. Earlier this session, there were a couple of bills introduced in the Illinois state House to move the date on which the general primary election is held. The thing about tracking the movement of presidential primaries is that one has to adapt to the differences across states in terms of what each calls its presidential primary elections. In the case of Illinois, the state has traditionally held a third Tuesday in March primary that is not only the date for the presidential primary but those for other state and federal offices as well. It is a consolidated primary every even-numbered year. And it should be additionally noted that the general primary in Illinois has only been on a date other than the third Tuesday in March in a presidential year once in the post-reform era. That was during the 2008 cycle when then-Illinois senator, Barack Obama, was seeking the Democratic nomination. Illinois, then, has been less likely to uproot its consolidated general primary election and shift it to an alternate date. Moreover, that fact is also relevant when trying to handicap the likelihood of passage for any bill with the goal of moving the general primary away from that traditional third Tuesday in March date. Attempts after the 2011 move back the traditional March date have generally languished in committee and died at the end of legislative sessions. That was true of a push by one legislator to move the consolidated primary to June in both 2013 and 2015 and again in 2017. It was also true of a 2015 bill to move the primary into July as well. And it was true again of 2018 legislation that proposed a marginal move to the first Tuesday in April that also failed. Now the 2019 session has brought two more bills once again promoting a change in the general primary date. One, HB 3476, represents a subtle change to the existing law. It would keep the primary in March and even keep it in the third week in March. The only change is to push the primary back from a Tuesday to the third Saturday in March. The other, HB 2531, is more in line with the repetitive 2013-2017 attempts to ease the primary into June. Although the 2019 version is by a different legislator -- this time a Republican rather than a Democrat -- and calls for a third Tuesday in June primary. While that is a week earlier than the bills from recent past sessions, it would still place the Illinois presidential primary just outside of the window in which states and territories are allowed by the national parties to hold primaries. Neither 2019 bill has seen any significant action following February introductions. One can draw from that what one may, but if past is prelude to either effort, then they are unlikely to advance. And that means that Illinois is most likely to retain its traditional March date. The Illinois presidential primary bills have been added to the 2020 FHQ presidential primary calendar. On Wednesday, March 27, Governor Gary Herbert (R) signed SB 242 into law. The bill reestablished and the law now explicitly schedules a presidential primary in the Beehive state for the first Tuesday in March during presidential election years. Utah will rejoin Super Tuesday for the first time since the 2008 cycle when the primary coincided with a de facto national primary day with over twenty contests in both parties. Utah at this time becomes the thirteenth state to schedule a primary or caucus for Super Tuesday. Of the 13, Utah will have fewer delegates at stake in the Democratic process than ten of the Super Tuesday states or territories. Only Vermont and Democrats Abroad will offer fewer delegates on Super Tuesday. Typically, that has been a combination -- few delegates at stake on a date that offers many more delegate-rich states -- that has led to smaller states getting lost in the shuffle. 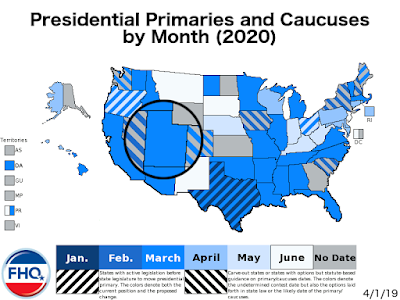 The Utah presidential primary change will be reflected on the 2020 FHQ presidential primary calendar. On Saturday, March 30, the Alaska Democratic Party released for public comment the party's draft delegate selection plan for the 2020 cycle. And in it were details from yet another traditionally caucus state laying the groundwork for a party-run primary. Yes, the caucuses will remain as the primary means through which delegates will be selected, but the allocation process will shift from hinging on the results of precinct caucuses to a party-run primary that will take place in at least nine locations across the state between 10am and 2pm on Saturday, April 4. No, a four hour voting window in just nine (to start) locations does not come across as adequate in a state as geographically large as Alaska, but Democrats in the Last Frontier have planned for that. In addition to the in-person voting on the April 4 primary day, Alaska Democrats will also have the option voting absentee by mail or electronically (in a system that remains undetermined). That window for alternate forms of voting will stretch from March 3 (Super Tuesday) through March 24. The Alaska draft plan calls for a ranked choice system of voting, elements of which have appeared in other formerly caucus states (Hawaii, Iowa and Nevada). The Alaska primary will for the second cycle in a row coincide with the contest in Hawaii. Although both are positioned after the fourth Tuesday in March, the pair alone does not qualify for a regional cluster bonus (15 percent added to the base delegation). Four years ago when Washington state Democrats joined the pair, the collective trio qualified for that bonus. Unless another partner joins the effort -- Oregon comes to mind (but is unlikely) as do the Pacific territories -- then Alaska and Hawaii would fall short of a 15 percent clustering bonus, but would maintain a 10 percent timing bonus for the April date of their contests. Alaska now joins Hawaii and North Dakota as non-carve-out and traditionally caucus states that have moved in the direction of party-run primaries as means of allocating delegates. The only states that have attempted so far to maintain the traditional caucus set up as a part of the allocation process are Iowa and Nevada. And one can hypothesize that such a move is a clear enough nod to the New Hampshire primary that both states' contests bookend. The other caucus states have no similar conflict. The Alaska party-run primary date has been added to the 2020 FHQ presidential primary calendar. FHQ has been following the release of delegate selection plans by state Democratic parties across the country since Idaho Democrats released their plan for public comment toward the end of January. 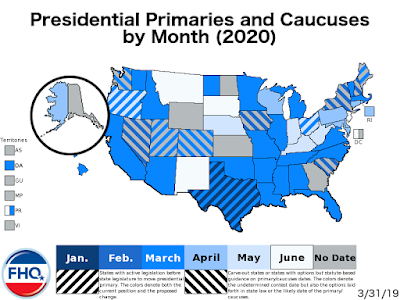 In particular, FHQ has kept an eye on caucus states, not only for the dates on which those contests are tentatively scheduled for 2020, but for how they plan to respond to the new DNC rules pushing for increased participation in the format. While Maine fits into that category as well -- traditional albeit not constant caucus state -- there is another set of attendant questions raised in the Pine Tree state: will there be a primary option and will Democrats there utilize it for delegate allocation? Following the release of the Maine Democratic Party draft delegate selection plan, the answer appears to be, "Caucuses, but we'll get back to you." The plan, then, lays out a caucus/convention system through which delegates to the national convention will be selected and allocated. However, the plan acknowledges that there is legislation pending in the Maine legislature to reestablish a presidential primary. In fact, there are two bills: one to establish a March presidential primary similar to the one that was created in 2016 but expired in 2018 and another similar bill that would conduct a March primary under a ranked choice voting system. One thing that can be gleaned from the Maine Democratic Party draft plan is that the party seemingly prefers the latter. Moreover, the plan indicates that should the ranked choice presidential primary bill pass the legislature and be signed into law, then the party would utilize the primary over the caucuses (and submit a revised plan to the DNC later). But until such time that Maine has a presidential primary codified in statute, Democrats will plan on conducting a caucus/convention system with precinct caucuses commencing on Sunday, March 8. That would put the Maine Democratic caucuses in line with the date of those conducted in 2016, the Sunday after Super Tuesday. That is not the only aspect of the planned caucuses that would carry over from previous cycles. Unlike the other caucus states that have released draft delegate selection plans thus far in 2019, Maine Democrats are not laying the groundwork for any fundamental changes to the caucus process to promote increased participation. There are no virtual caucuses. There is no early voting. Instead, the party will, in the event that it conducts caucuses, rely on the same no-excuse absentee voting system the party has used since 2004 to allow those Democrats with conflicts with the caucuses' date and/or time to express their presidential preference. One can read that at least a couple of different ways. First, the state party is comfortable with the past level of participation under an absentee system that has been tested over four presidential cycles. But second, while maintaining the status quo may indicate how confident the state party may be in the plan passing muster with the DNC Rules and Bylaws Committee, it may also signal some confidence that the party is waiting on the state legislature to work through the particulars of a presidential primary option. [It could, of course, be both as well.] One thing is for certain: the Maine legislature will adjourn in mid-June, so an answer would come between now and then. Both primary bills have been shelved in committee awaiting a working hearing at which time the bills may be amended. One other aspect of the current draft plan from the Maine Democratic Party worth flagging is the proposed way of allocating delegates. The preference on that front appears to be for a truly proportional method with no threshold to qualify for delegates. In other words, candidates would not have to win up 15 percent or more of the vote statewide or in one of the two congressional districts to be allocated any delegates. If that gets rejected by the RBC and the party cannot win a waiver to allocate delegates in that way, then it will use the traditional 15 percent threshold to determine which candidates receive delegates and those who do not. The tentative caucus date for Maine has been added to the 2020 FHQ presidential primary calendar. The Hawaii Democratic Party on Monday, March 25 released its draft 2020 delegate selection plan for a thirty day comment period. Traditionally a caucus state, but faced with new encouragements from the DNC concerning participation in that format, Hawaii Democrats have opted instead to pursue a party-run primary for the 2020 cycle. Although the language used in the plan refers to the Saturday, April 4 event as both a preference poll and a primary, the reality is that, much like North Dakota before it, Hawaii Democrats will attempt to broaden participation in the presidential nomination process. At 20 locations around the Aloha state, Hawaii Democrats will be able to vote for their top three preferences in a limited ranked choice voting system between 7am and 3pm on April 4. Additionally, the party will allow for an early vote-by-mail period (with the same limited top three preferences ranked choice system) that stretches from March 3 (Super Tuesday) through March 28. While that part -- the early vote-by-mail window -- of the process is occurring, Hawaii Democrats will hold precinct meetings to begin the selection process. On Wednesday, March 4 (the day after Super Tuesday), those precinct meetings will choose delegates to the May 23-24 state convention where national convention delegates will be chosen. This is further evidence of state parties, especially caucus state parties, straying from business as usual. Moreover, it provides at least some credence to the notion that later caucus states -- those not in the February carve-out state window -- are freer to move in the direction of contests that look more like primary election, but primaries conducted by the state parties. North Dakota and Hawaii have followed the sort of "firehouse caucus" model that came out of the discussions dating all the way back to the 2016 national convention in Philadelphia and were noted in the Unity Reform Commission report. Thus far, only Iowa and Nevada -- both states tiptoeing around the New Hampshire primary they bookend -- have attempted to thread a certain needle, maintaining the traditional caucuses while opening the door through early voting and/or virtual caucuses as a means of increasing participation. Neither followed the "firehouse caucus" model and New Hampshire is why. The remaining caucus states are mostly not actually states at all, but territories. Although there are a few states yet to release their draft delegate selection plans, it is likely that they follow the model more similar to what Hawaii has outlined above. However, it remains to be seen what territorial parties will do with their contests. Time will tell. All drafts are due to the DNC Rules and Bylaws Committee for review by May 3. The Hawaii party-run primary date has been added to the 2020 FHQ presidential primary calendar.